It is summertime along the east coast and we are seeing gardens in full bloom in the heart of this season. Whether they are front yard gardens on display for passerby’s or hidden intimate garden area on the back property, there are many ways to enhance and embellish these gardens. Of course first and foremost, the proper care and maintenance of your garden is the most important aspect for sustaining beauty. Choosing specimens that will thrive best with the existing conditions of sun, shade and soil is imperative for success. Once the garden is established, many homeowners will incorporate landscape art pieces of landscape sculptures to further enhance and complement their gardens. Landscape sculptures can be a budget friendly way to enhance your property. Adding a piece of artwork that complements the style of your home and garden will create an eye-catching focal point. As is true with most things, location is very important when placing these landscape sculptures. It is best to choose an area where they can be properly displayed and not hindered by any specimens. 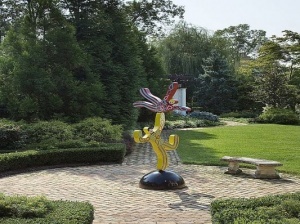 Landscape sculptures can be elevated on a stand to be properly viewed. If you are looking to invest in a pricier piece of art for your garden there are a few things to keep in mind. If the garden is going to evolve and grow over time, it is best to invest in a landscape sculpture that can be repositioned in other places on the property as well. Rare or one of a kind artwork should be placed in an area where it will be highly visible. If the landscape sculpture is too small, it will look lost in a vast area and should be positioned somewhere that it will stand out as the main attraction. Looking into local artists in your area is a great source for creating unique and custom artwork for your garden. It is a nice way to add a unique touch to your property while also giving back to the community. Often times, a landscape sculpture is purchased even before the garden is created, in which case the design for the garden can be based around the fixture. That way, the garden is the optimal design to best suit the main artwork focal point.